Cherry and Spoon: Minnesota Fringe Festival 2018: "Slapdash Panic: Comedy Suitcase ended up in the Fringe Festival with 3 weeks notice and no show!" Minnesota Fringe Festival 2018: "Slapdash Panic: Comedy Suitcase ended up in the Fringe Festival with 3 weeks notice and no show!" 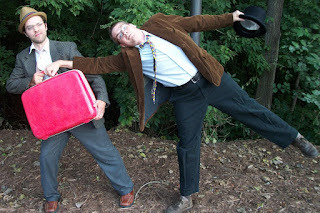 Title: Slapdash Panic: Comedy Suitcase ended up in the Fringe Festival with 3 weeks notice and no show! Summary: There's no show, just a couple of guys being goofy. Highlights: "What's a concise way to say welcome to something happening live in front of your face that may or may not be worth the price of admission?" "Welcome to the Fringe!" Fringe favorites Comedy Suitcase, aka dynamic duo Joshua English Scrimshaw and Levi Weinhagen, said yes when their wait list spot turned into a Fringe show just three weeks before the festival start. The schtick is that they haven't come up with a show and are just winging it, but of course they do have a show planned, although very loosely structured. There's lots of running around panicking at the beginning, and then they settle into doing things to make the audience laugh (a lot). There's a very short improv scene, physical humor, audience participation, drawing stories, a comedy workshop on writing jokes, a brief scene reading (with audience help) from Joshua's other show about old-timey radio, and a dance party. I'd rather watch Scrimshaw and Weinhagen do nothing than many people do something. If you want to laugh, have a good time, and enjoy the silliness for an hour, regardless of age (this show could and should be at Family Fringe, except then we couldn't use our Fringe passes), go see this show that's not a show but really it is a show. And a super fun one.